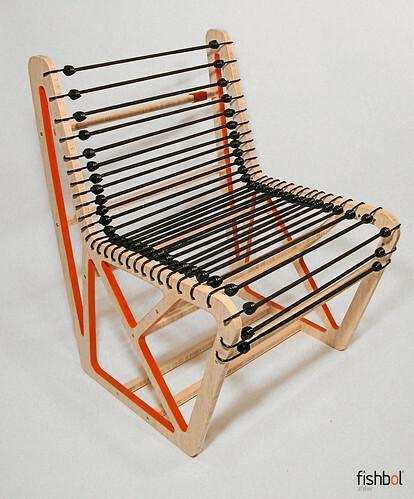 My design process for the Bungeeseat was a precedent‐based exploration on material and ideas. The first of my sketches came from a visit to the design museum in London which featured an exhibition called “Design Cities”*; seven cities were presented. Bungeeseat combines elements of Rene Herbst’s Chaise Sandows with the structural language of Jean Prouve whose works were exhibited at the show in London. Keeping the core elements of these two examples, I began our own digital iterations of this model. This project became a platform for a series of parametric explorations in our furniture design process. 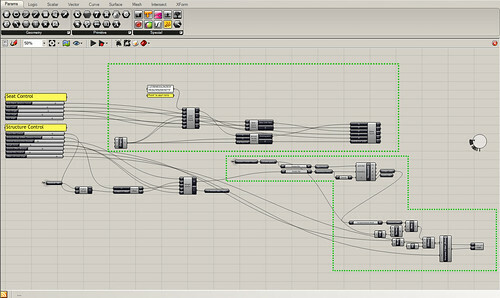 With a series of modeling scripts and algorithms, I was able to achieve real‐time visualization and calculations of components for improved performances in my designs. Rene Herbst ‐ The French architect turned designer was nicknamed the “man of steel”. He pioneered the use of industrial materials for furniture years before mass production on a large scale was possible. In 1929 he created several versions of his celebrated Sandows Chair, which ignited his research into serial production and inaugurated the era of mass production in the hype of modernism**, giving impetus to global production and a new era for design and architecture. Modernism and the ideas from that movement are fascinating for me, but it was not my intention to recreate modern furniture with modern ideals; my approach was nostalgo‐modern along with today’s conscious in material selection. Rather than the concept of global/mass production, we focused on limited production at Fishbol. The other part of this project was to figure out Toronto’s role as the “Eighth Design City.” Our intention was to keep production local and more responsible to the environment. I was able to supply the bungee cords from an old Canadian manufacturing company here in downtown Toronto, and the Bamboo‐ply is from a supplier in Markham, Ontario. Though the Bamboo‐ply is not sourced locally, it is considered a rapidly renewable resource with extra structural strength. These qualities made bamboo‐ply a better choice compared to conventional Baltic‐Birch plywood that was used for my first study models and prototypes. The final phase is packaging for projects like the Bungeeseat. 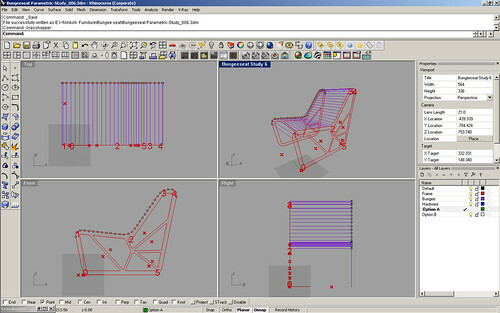 Going back to the drafting board and study models with the help of Sara Navid, we developed a quite stylish reusable cardboard box that would allow for repackaging of this ready‐to‐assemble (RTA) chair. Most of the packaging design was done by Elie. choice compared to conventional Baltic‐Birch plywood that was used for our first study models and prototypes.